Gerrit R J Melles, MD, Rotterdam Eye Hospital, Schiedamse Vest 180, PO Box 70030, 3000 LM Rotterdam, Netherlands. AIMS To describe a new surgical technique for deep stromal anterior lamellar keratoplasty. METHODS In eye bank eyes and sighted human eyes, aqueous was exchanged by air, to visualise the posterior corneal surface−that is, the “air to endothelium” interface. Through a 5.0 mm scleral incision, a deep stromal pocket was created across the cornea, using the air to endothelium interface as a reference plane for dissection depth. The pocket was filled with viscoelastic, and an anterior corneal lamella was excised. A full thickness donor button was sutured into the recipient bed after stripping its Descemet’s membrane. RESULTS In 25 consecutive human eye bank eyes, a 12% microperforation rate was found. Corneal dissection depth averaged 95.4% (SD 2.7%). Six patient eyes had uneventful surgeries; in a seventh eye, perforation of the lamellar bed occurred. All transplants cleared. Central pachymetry ranged from 0.62 to 0.73 mm. CONCLUSION With this technique a deep stromal anterior lamellar keratoplasty can be performed with the donor to recipient interface just anterior to the posterior corneal surface. The technique has the advantage that the dissection can be completed in the event of inadvertent microperforation, or that the procedure can be aborted to perform a planned penetrating keratoplasty. Anterior lamellar keratoplasty is a surgical procedure in which the anterior layers of the cornea (epithelium, its basement membrane, Bowman’s layer, and stroma) to a variable depth, are replaced by donor tissue.1-10 Commonly, the anterior stroma is incised with a trephine that can be set to a depth not exceeding the corneal thickness. From the bottom of the incision, several corneal layers may be dissected until the desired depth of the recipient stromal bed is obtained. With all these techniques the stromal dissection depth relative to the corneal thickness cannot be optically visualised. The posterior corneal surface is invisible through an operating microscope, owing to the small difference in the refractive index between corneal tissue and aqueous.19 Lamellar dissection techniques therefore bear the risk of inadvertent perforation when deeper dissections are intended. If perforation occurs completion of the stromal dissection can be difficult, so that the donor button may have to be sutured into an imperfectly prepared recipient bed. When conversion of the procedure into a penetrating keratoplasty is required, donor tissue with good quality endothelium may not be available. The purpose of our study was to design a lamellar keratoplasty surgical technique in which a stromal dissection can be made to a visually controlled depth during surgery, and which allows for completion of the dissection in the event of a microperforation, or abortion of the entire procedure until a planned penetrating keratoplasty can be performed. Seven patients enrolled in the study (Table 2), after institutional review board approved informed consent was obtained. Before and after surgery a complete ocular examination was performed, and central pachymetry measurements and slit lamp photographs were taken (Kodak Ektachrome 160T, colour slide film). Under local or general anaesthesia, corneal transplantation procedures (Fig 1) were performed by one of us (GM). At the end of each operation, 0.5 ml gentamicin sulphate (Garamycin 40 mg/ml, Schering-Plough, Weesp, NL) and 1.0 ml betamethasone (Celestone 5.3 mg/ml, Schering-Plough, Weesp, NL) were injected subconjunctivally. Diagrammatic representation of the deep, anterior lamellar keratoplasty technique. (A) After dissection of a deep stromal pocket through a scleral incision. (B and C) Viscoelastic is injected into the pocket, and an anterior corneal lamella is trephinated from the recipient cornea. (D) After stripping Descemet’s membrane, a full thickness donor corneal button is sutured into the recipient stromal bed. Compare with Figures 2A–C and 3A–F. In all recipient eyes (eyes 6–30 and patients 1–7; Table 1), a self sealing side port was made at the 9 o’clock limbus, to aspirate the aqueous using a blunt canula, and to completely fill the anterior chamber with air. At the 12 o’clock limbus, the conjunctiva was opened and a superficial scleral incision was made, 5.0 mm in length, 1 mm outside the limbus. With a custom made dissection blade (Dorc, Zuìdland, NL),22 a lamellar dissection was made to just within the superior cornea. 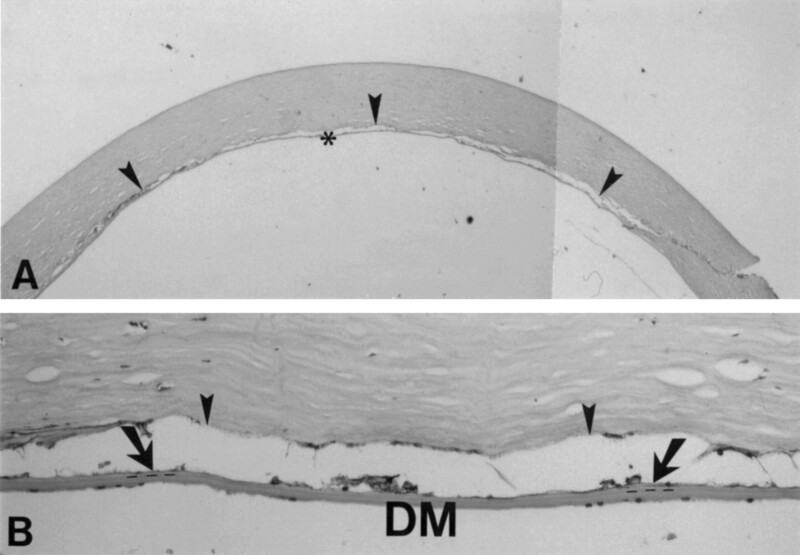 At this point, the tip of the blade was slightly tilted downward to visualise the interface between the air bubble in the anterior chamber and the corneal endothelium; underneath the corneal “dimple”, the “air to endothelium” interface was seen as a specular light reflex localised at the tip of the blade (Fig2A).23 Between the blade tip and the light reflex, a non-reflective, dark band was seen, representing the non-incised corneal tissue between the blade and the air to endothelium interface. Because the dark band became thinner with advancement of the blade into the deeper stromal layers, the corneal depth of the blade could be judged from the thickness of the dark band (Fig 2B). When the tip of the blade appeared to touch the air to endothelium light reflex (Fig2C)—that is, the posterior corneal surface, the blade was positioned parallel to the posterior surface, for dissection of a stromal pocket across the cornea, just anterior to the posterior corneal surface (Figs1A and 3A). Demonstration of the surgical technique in a human eye bank eye. (A) The anterior chamber has been filled with air. In between the blade tip and the air to endothelial interface light reflex, a dark band (arrowheads) is visible. (B) Because the dark band reflects unincised posterior corneal tissue, the dark band decreases in width when the blade is advanced into the deeper stromal layers. (C) When the blade appears to touch the air to endothelium interface, a stromal dissection level just anterior to the posterior corneal surface is reached. Demonstration of the surgical technique in a human eye bank eye. (A) The pocket is dissected first across the vertical meridian, and then extended sideways up to the limbus over 360°, with the same spatula. Note that the anterior chamber is completely filled with air, and that the dissection depth can be monitored by the width of the dark band (arrowhead) in between the spatula and the air to endothelium light reflex. Note also the wrinkling of the posterior corneal tissue (arrow). 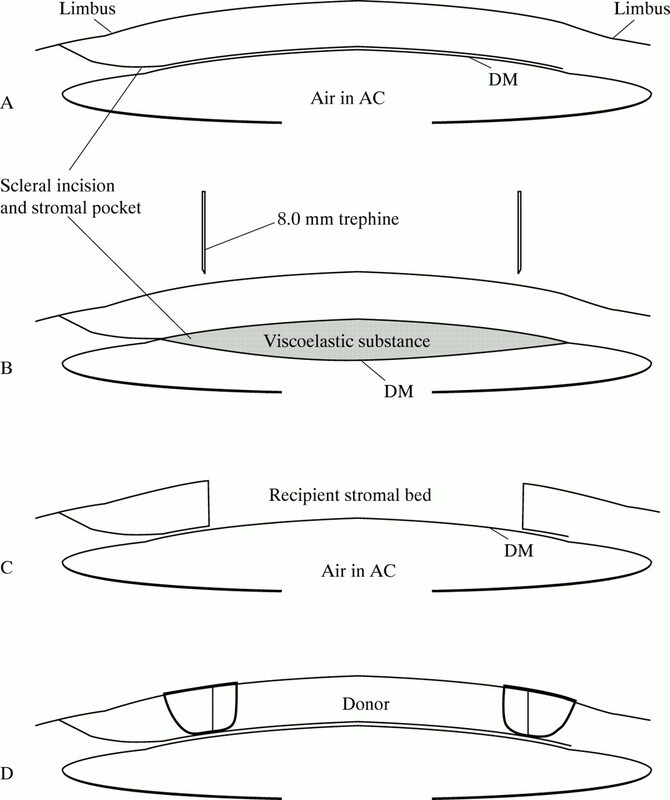 (B) After most air has been removed from the anterior chamber, the stromal pocket is filled with viscoelastic. Note the step ladder configuration of the relaxed posterior corneal tissue (arrow) which is pushed downward. (C) After trephination with a Hessburg–Barron trephine (D) an anterior corneal lamella is excised. Note the smooth recipient bed (asterisk) with some residual posterior stroma overlying the pupillary border (arrowheads). Pupillary dilatation was not intended as a part of the procedure. 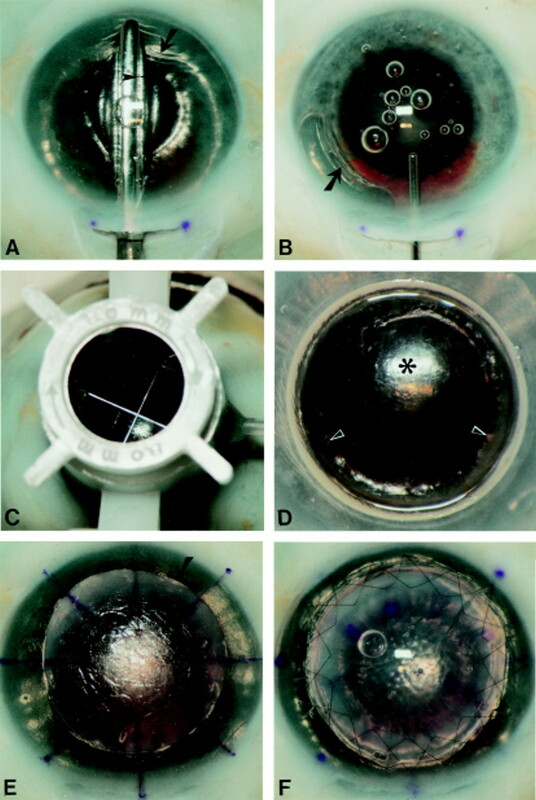 (E) After stripping Descemet’s membrane, a “full thickness” donor button (arrow) is placed onto the recipient bed, and the donor and recipient corneal surfaces are marked with an eight incision radial keratotomy marker. (F) The donor button sutured in place with two running sutures. Pupillary dilatation was not an intended part of the procedure. After a deep stromal pocket was created up to the limbus over 360°, the air was removed from the anterior chamber, and a viscoelastic (hydroxypropylmethylcellulose, Ocucoat, Storz, Clearwater, FL, USA) was injected through the scleral incision into the stromal pocket (Figs 1B and 3B). Thus, the posterior corneal lamella was separated from the overlying anterior stroma, to avoid perforation of the posterior corneal surface during trephination. Then, a Hessburg–Barron suction trephine was centred over the anterior corneal surface (Fig 3C). The blade was turned downward until the stromal pocket was just entered—that is, until viscoelastic was seen to escape from the pocket through the trephine incision. Remaining, unincised stromal attachments of the anterior lamella were cut with curved microscissors, the anterior corneal lamella was removed, and the recipient bed was thoroughly irrigated to remove all viscoelastic and debris (Figs 1C and3D). Corneoscleral rims were mounted endothelial side up on a concave punch block (Medical Workshop, De Meern, NL). With a dry cellulose sponge, the posterior corneal surface was gently swabbed, to remove Descemet’s membrane and the endothelium. Then, a 0.25 or 0.5 mm oversized donor corneal button was punched out with a punch trephine (Ophtec, Groningen, NL). 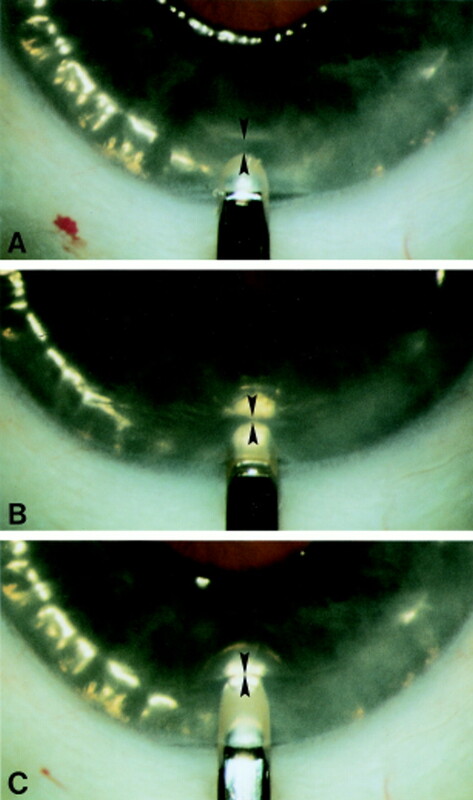 The donor button was transferred to the recipient stromal bed, and the donor and recipient corneal surfaces were marked with an eight incision radial keratotomy marker (Fig 3E). The button was sutured into the recipient bed with two running, 10-0 monofilament nylon sutures (Alcon, Gorinchem, Netherlands) (Fig 3F). The tension of the sutures was adjusted until the anterior, donor corneal surface reflected a spherical image of a placido disc held about 3 cm above the recipient eye. Light microscopy of a deep lamellar dissection through a scleral incision in a human eye bank eye. (A) A deep stromal dissection level (arrowheads) is seen (98% corneal depth). (B) Few stromal lamellae (arrows) are visible between the stromal dissection and Descemet’s membrane; the dotted line indicates the junction of the stroma and Descemet’s membrane (haematoxylin and eosin, original magnification ×35 and ×450). The surgical procedure was completed in 25 consecutive human eye bank eyes (eyes 6–30; Table 1). In three eyes (12%) a microperforation occurred while the deep lamellar dissection was made. Microperforations were noted by the escape of air from the anterior chamber into the stromal pocket. In these eyes, the dissection could be completed across the cornea, after restoring the intraocular pressure by injection of additional air in the anterior chamber. Corneal dissection depth averaged 95.4% (SD 2.7%), as measured with light microscopy in eyes 1–5 (Figs 4A and B; Table 1). Six of seven patients’ eyes underwent uneventful surgeries (patients 1–4, 6, and 7; Table 2). In one eye (patient 5; Table 2), a perforation of the recipient, central stromal bed occurred after the removal of the recipient anterior lamella. To avoid central interface scarring and the potential development of an intrastromal “pseudoanterior chamber” after surgery, the procedure was converted into a penetrating keratoplasty. At the first postoperative day, one eye (patient 3; Table 2) had a layer of residual viscoelastic in the stromal interface. Because the viscoelastic was still present 1 month after surgery, it was removed by irrigation of the interface after partial removal of the donor button, and the button was sutured back in place. Throughout the postoperative period, all eyes had clear transplants (Fig 5). Patients who had a deep lamellar keratoplasty (patients 1–4, 6, and 7; Table 2) maintained apposition of the donor and recipient stromal surfaces, with minimal interface scarring. For these eyes, best corrected visual acuity ranged from 0.25 to 1.0, and the astigmatic error ranged from 1 to 3.5 D. Central pachymetry ranged from 0.62 to 0.73 mm, without evidence of epithelial or stromal oedema. One eye (patient 4; Table 2) that had been operated for keratoconus, had a meshwork-like wrinkling of Descemet’s membrane which appeared to smooth with time. Slit lamp photograph 6 months (patient eye 1) after deep, anterior lamellar keratoplasty. A clear lamellar corneal transplant is visible, with a deep stromal, donor to recipient interface (arrow). Several lamellar keratoplasty dissection techniques have been described.1-10 13-18 One flaw of these techniques is that the depth of the stromal dissection cannot be visualised during surgery, and that the procedures therefore bear the risk of perforation. Another flaw is that the recipient bed is created by a “layer for layer” removal of corneal tissue. Once started, the procedure must be completed as a lamellar or penetrating keratoplasty, although donor tissue requirements differ for each of these procedures. In lamellar keratoplasty, a donor corneal lamella is generally obtained from a fresh globe with unknown endothelial quality, or lyophilised corneal tissue. When the dissection of the recipient stromal bed cannot be completed owing to inadvertent perforation, donor tissue with good quality endothelium may not be available to convert to a penetrating keratoplasty. Alternatively, the donor lamella may be sutured into an imperfect recipient stromal bed, or the recipient lamella may be sutured back to perform a lamellar keratoplasty after the perforation site has healed. In the current study, a three step surgical technique is described to perform a deep stromal, anterior lamellar keratoplasty procedure, in which the depth of the dissection relative to the corneal thickness can be visualised during surgery.23 Furthermore, the procedure can be completed in the event of a microperforation, or it can be aborted to perform a planned penetrating keratoplasty. As a first step, a deep stromal, lamellar dissection is made to a visually controlled depth. Injection of air into the anterior chamber may facilitate deep stromal dissection for four reasons. Firstly, because the air to endothelium interface reflects the posterior corneal surface, its specular light reflex may be used as a reference plane for desired dissection depth. When the dissection blade is tilted slightly downward, the non-incised corneal tissue between the tip of the blade and the posterior corneal surface is visible as a dark band directly adjacent to the blade, and bordered by the air to endothelium light reflex. Because the thickness of the dark band decreases with deeper stromal blade depth, the light reflex can be used as a reference plane to direct the blade towards the posterior corneal surface—that is, to advance the blade downward until the dark band has disappeared. Secondly, small folds in Descemet’s membrane can be seen during the performance of deep stromal dissections. When the anterior chamber is filled with air, these folds are accentuated, and the number, width, and motility of the folds seem to indicate how close to Descemet’s membrane the dissection is made. Thirdly, microperforations are easily noted during surgery, since a small air bubble is seen to escape from the anterior chamber into the stromal pocket, and the break in Descemet’s membrane is sharply outlined over the underlying air bubble. Fourthly, in the event of a microperforation, the break in Descemet’s membrane is self sealing by the air in the anterior chamber, and the dissection may be continued without loss of the intraocular pressure. As in conventional lamellar keratoplasty, the presence of a perforation site could be complicated by the formation of an intrastromal pseudoanterior chamber after surgery. As a second step of the procedure, viscoelastic is injected into the stromal pocket to displace the entire posterior corneal surface toward the iris, thereby creating a “pseudoanterior chamber”. Because the stromal pocket is made through a self sealing scleral tunnel incision, the viscoelastic remains within the pocket when pressure is applied onto the anterior corneal surface. Thus, a “normal” intraocular pressure can be restored after the injection of viscoelastic into the stromal pocket, and the anterior, diseased recipient corneal tissue may be excised with routine trephination techniques, without damage to the posterior corneal surface. In one of our patients, residual viscoelastic remained in the stromal interface after surgery. After removal, the best corrected visual increased from finger counting to 0.4 in the first postoperative week. It seems therefore important to completely remove all viscoelastic at the recipient stromal bed before suturing the donor corneal button in place. As a third step, a donor button is transplanted into the recipient bed using standard keratoplasty surgical instruments and techniques. After the deep keratectomy, the recipient wound edges are approximately 95% in stromal depth, and a full thickness donor button is sutured into the recipient opening.5 When the donor tissue thickness exceeds the depth of the recipient bed, the donor button still fits because the peripheral recipient cornea is split while the dissection is made, and the excess thickness of the button only causes little separation of the recipient, posterior stromal layers. Since the 1960s, lamellar keratoplasty may have lost its popularity owing to the imperfections of the existing surgical techniques rather than poor visual outcomes. Although better microkeratomes have become available with the development of laser assisted in situ keratomileusis (LASIK), microkeratome lamellar resections cannot be used for disorders with deep stromal opacities, variable corneal thickness, and surface irregularities. Improvement of the manual technique for lamellar keratoplasty could therefore potentially broaden the interest for the procedure again, to manage anterior corneal disorders. Sponsored by a grant for the Van Loenen Martinet Corneal Fellowship from the Rotterdamse Vereniging voor Blindenbelangen. We thank the Cornea Bank of the Netherlands Ophthalmic Research Institute, Amsterdam, Netherlands; and Bio Implant Services, Leiden, Netherlands, for their valuable cooperation. (1971) Lamellar keratoplasty. Malbran’s “peeling off” technique. Arch Ophthalmol 86:293–295. (1972) Lamellar keratoplasty (special techniques). Ann Ophthalmol 4:437–469. (1972) Dissection technique in lamellar keratoplasty. Br J Ophthalmol 56:711–713. (1979) Lamellar keratoplasty in the treatment of keratoconus: conectomy. Ophthalmic Surg 10:26–33. (1982) Full-thickness lamellar keratoplasty. A histologic study in human eyes. Ophthalmology 89:715–719. 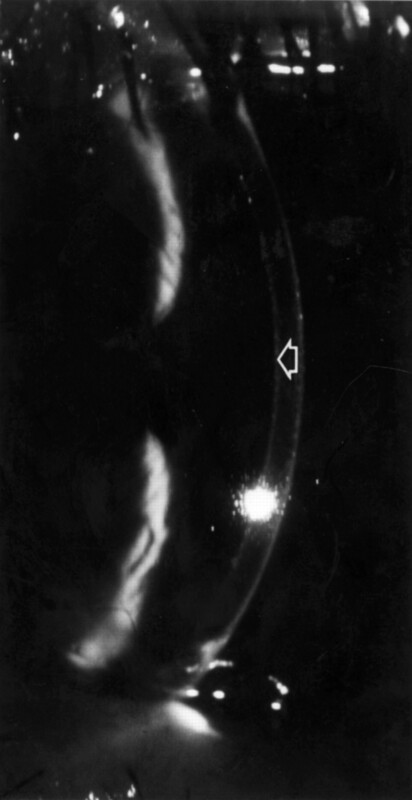 , eds(1984) Technique for lamellar keratoplasty. Microsurgery of the cornea. (Ediciones Scriba, Barcelona), pp 195–212. (1988) An improved method for lamellar keratoplasty. CLAO J 14:42–46. (1988) Techniques of lamellar keratoplasty. Int Ophthalmol Clin 28:24–29. (1994) Lamellar keratoplasty in the management of inflammatory corneal ulceration and perforation. Eye 8:22–28. (1997) Lebend-Epikeratophakie und Tiefe Lamelläre Keratoplastik zur Stadiengerechten chirurgischen Behandlung des Keratokonus (KK) I-III. Klin Monatsbl Augenheilkd 211:94–100. (1978) A comparison of penetrating keratoplasty and lamellar keratoplasty in the surgical management of keratoconus. Am J Ophthalmol 86:807–811. (1994) Granular dystrophy. Visual results and pattern of recurrence after lamellar or penetrating keratoplasty. Ophthalmology 101:1812–1817. (1984/85) Deep lamellar keratoplasty dissection of host tissue with intrastromal air injection. Cornea 3:217–218. (1989) Air lamellar keratoplasty. Refract Corneal Surg 5:240–243. (1992) Deep lamellar keratoplasty on air with lyophilised tissue. Br J Ophthalmol 76:646–650. (1993) Visual improvement as a function of time after lamellar keratoplasty for keratoconus. Am J Ophthalmol 116:207–211. (1996) Lamellierende Keratoplastik mit dem Excimerlaser. Erste klinische Ergebnisse. Ophthalmologe 93:242–246. (1997) Deep lamellar keratoplasty with complete removal of pathological stroma for vision improvement. Br J Ophthalmol 81:184–188. Katz M. The human eye as an optical system. In: Tasman W, Jaeger AE, eds. Duane’s clinical ophthalmology. Vol 1, Chapter 33. Philadelphia: JB Lippincott, 1993..
(1986) Tissue storage. E: Organ culture and endothelial evaluation as a preservation method for human corneas. in Corneal surgery. Theory, technique, and tissue. ed Brightbill FS(CV Mosby, St Louis), pp 93–102. (1993) Effect of blade configuration, knife action, and intraocular pressure on keratotomy incision depth and shape. Cornea 12:299–309. (1998) Depth predictability of stromal pockets in the posterior cornea. Cornea 17:174–179. Melles GRJ, Rietveld FJR, Beekhuis WH, et al. A technique to visualize corneal incision and lamellar dissection depth during surgery. Cornea (in press)..
(1998) A surgical technique for posterior lamellar keratoplasty. Cornea 17:618–626. (1969) Transplantation and rejection of individual layers of the cornea. Invest Ophthalmol 8:180–195. (1981) The effect of air on human corneal endothelium. Am J Ophthalmol 92:328–331. (1997) Corneal endothelial damage by air bubbles during phacoemulsification. Arch Ophthalmol 115:81–88.